Iittala was founded in Finland in 1881 by Petter Magnus Abrahamsson, and merged with Karhula in 1917. Designers for the company include Yrjo Rosola, Arttu Brummer, Aarre Putro. Aino Aalto and her husband Alvar Aalto, Kaj Franck, Timo Sarpaneva and Tapio Wirkkala. The company is still in production today. Iittala white, green + blue glass 'Akvarelli' (watercolour) vase, 185mm tall, designed by Mikko Karppanen in 1984, pattern number 2720, labelled. Ref: Iittala 125 Years of Finnish Glass p255. 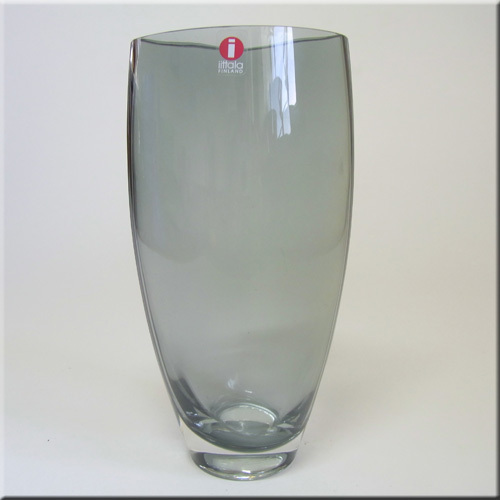 Iittala smokey + clear glass 'Leia' vase, 170mm tall, designed by Tina Nordström in 1996, pattern number 2785, labelled. Ref: Iittala 125 Years of Finnish Glass p256. Iittala frosted/sand-blasted glass 'Tulip' votive candle holder, 70mm tall, designed by Jorma Vennola in 1985, pattern number 2624, labelled + boxed. Ref: Iittala 125 Years of Finnish Glass p237. Iittala clear glass 'Kuusi' sugar bowl 65 mm tall by 105mm diameter, designed by Jorma Vennola in 1982, pattern number 2416, labelled. Ref: Iittala 125 Years of Finnish Glass p236. Iittala blue glass 'Savoy' votive candle holder, 50mm tall, designed by Alvar Aalto in 1936, pattern number 3030, labelled. Ref: Iittala 125 Years of Finnish Glass p211. Iittala purple glass 'Savoy' votive candle holder, 50mm tall, designed by Alvar Aalto in 1936, pattern number 3030, labelled. Iittala clear glass 'Savoy' votive candle holder, 50mm tall, designed by Alvar Aalto in 1936, pattern number 3030, labelled + boxed. Iittala turquoise glass "Nappi" votive candle holder with label, 30mm tall, designed by Markku Salo. Iittala green glass "Nappi" votive candle holder with label, 30mm tall, designed by Markku Salo. Iittala clear ice textured glass candlestick, from the "Festivo" range, 80mm tall, designed by Timo Sarpaneva in 1966, pattern number 2665, labelled. Ref: Iittala 125 Years of Finnish Glass p229. Group of Iittala clear ice textured glass candlesticks, from the "Festivo" range, designed by Timo Sarpaneva in 1966. 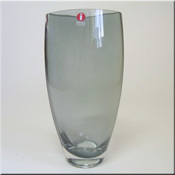 Ref: Iittala 125 Years of Finnish Glass p229. Iittala clear ice textured glass candlestick, from the "Festivo" range, 120mm tall, designed by Timo Sarpaneva in 1966, pattern number 2665, signed to base. Iittala apple green glass "Tris" votive candle holder with label, 72mm tall, designed by Alfredo Häberli in 2003, pattern number 2610, boxed. Ref: Iittala 125 Years of Finnish Glass p254. Iittala blue glass 'Ballo' votive candle holder with label, 45mm tall by 92mm diameter, designed by Annaleena Hakatie in 1995, pattern number 2629-045. 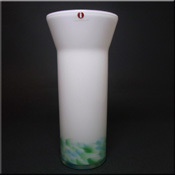 Iittala turquoise glass 'Ballo' votive candle holder with label, 45mm tall by 92mm diameter, designed by Annaleena Hakatie in 1995, pattern number 2629-045. Iittala blue glass "Halo" votive candle holder with label, designed by Harri Koskinen. Iittala apple green glass votive candle holder, 60mm tall, designed by Alvar Aalto in 1936, pattern number 3031, labelled. Iittala green glass 'Kivi' (stone) votive candle holder with label, 60mm tall, designed by Heikki Orvola in 1987. Ref: Iittala 125 Years of Finnish Glass p257. Iittala blue glass 'Kivi' (stone) votive candle holder with label, 60mm tall, designed by Heikki Orvola in 1987. Iittala smokey glass 'Kartio' votive candle holder, 50mm tall, designed by Kaj Franck. Iittala blue glass 'Kartio' votive candle holder, 50mm tall, designed by Kaj Franck, labelled. Iittala green glass 'Kartio' votive candle holder, 50mm tall, designed by Kaj Franck, labelled.